It’s not easy to transition back to civilian life — but we’re here to help. 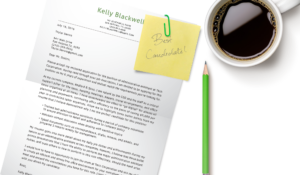 Use our downloadable military to civilian resume sample and writing tips below for guidance. Adept understanding of structural engineering pertaining to steel bridges, timber structures, tunneling, and retaining walls. Extensive knowledge of explosive demolition materials and techniques. Proven desire to excel demonstrated by being awarded the Super Sapper award administered by the Army Engineer Association in 2013. Consistent exemplary individual and team reviews. Conducted combat trainings for a squad consisting of 8 combat engineers. Assisted in the design and implementation of modernized training programs and schedules. Supervised maintenance and usage of heavy combat vehicles. Managed and facilitated demolitions planning pertaining to various bridge designs. Cooperated in the development and improvement of operating procedures and tactics for armored vehicle-launched bridge machinery. Planned, deployed, and monitored defensive explosive charges. Assisted in training 3 junior engineers in safe explosive disarmament practices. Performed routine equipment and machinery audits ensuring all important equipment was present and in proper working order. Proficient in AutoCAD and Revit software applications. Jumping into the hunt for a new job requires the right mindset and a lot of preparation. Added to that, transitioning from years in the armed forces to a civilian lifestyle is a major change, and with any major lifestyle change, it can be extremely stressful. Combine the two and you have a big headache directly in the path of starting your new career. Not to worry — we’re here to help! A military resume and a civilian resume are two very different beasts. Your odds of having your resume reviewed by a human resources representative or a hiring manager improve drastically if you change the military parlance into more common vernacular. Don’t: Go heavy on acronyms and jargon. Frequent co-op with ING over ISR information. Do: Use wording that a civilian with zero military experience would understand. Communicated sensitive information in a timely manner with international intermediaries. Also, while military resumes tend to go into extreme detail about specific pieces of equipment you’re trained on, a civilian responsible for hiring candidates for non-military positions is not going to know what most of the equipment is. Listing that you are trained on a sophisticated and currently classified new targeting system for the M1A2 Abrams Battle Tank is more likely to make a hiring manager’s eyes gloss over than it will convince them that you’re perfect for the new insurance sales position. Try broadening your specific skills into abilities that a company would find useful. There are many directly transferrable skills that men and women pick up while serving in the military. Jotting these down before you start writing your resume can help you organize your thoughts. It also let’s you take skills learned from your experience in the military and target jobs that require those skills. Take skills learned from your experience in the military and target jobs that require those skills. An example would be that a former Air Force Technical Aircraft Mechanic specialist has skills that translate directly into aviation maintenance and repair, as well as a solid know-how of electronics and possibly even hydraulics. Targeting airlines, private air charter companies and services, logistics companies like FedEx and UPS, and aircraft manufacturers for work would yield many more interviews than trying to jump into the finance or health industries. There’s also no need to spin this type of skill or experience. There are military skills that translate directly into civilian jobs, and as long as you phrase them in a manner fitting a civilian style resume, they should be clear to anyone tasked with reviewing resumes. This is the hard part. There are a lot of skills that a veteran picks up during their service that are extremely valuable to employers, but knowing how to phrase them on a civilian resume is a little tricky. A former Army Arms Combat Generalist‘s skills don’t translate directly into many industries, but the certain abilities picked up in that type of service are still valuable, such as the learned skill of risk management. A former Navy Information Warfare Officer does have acquired skills that translate directly in the IT world, but they also have learned critical thinking skills. A former Marine Infantry Officer can always cite the fact that they have ample proven leadership abilities. It doesn’t matter what job you had while in the military, you are sure to have some useful and marketable skills. Just make sure to phrase them in a way easily understood by a civilian. 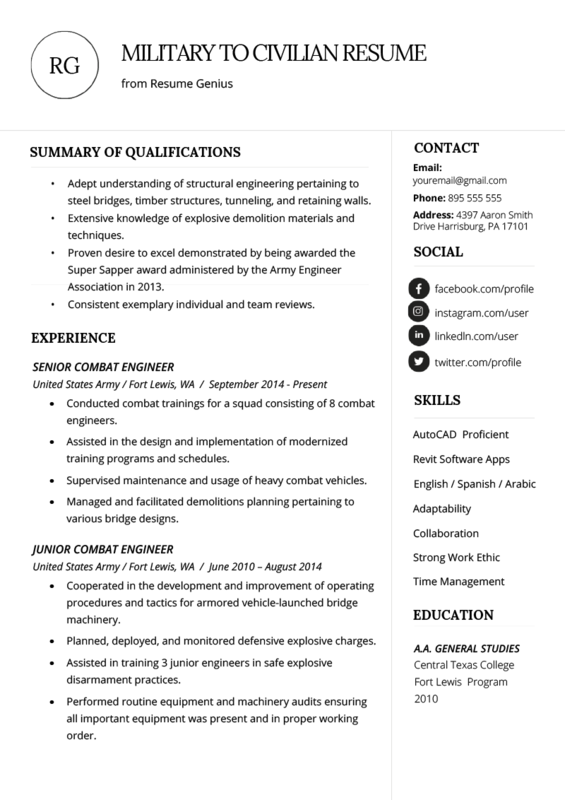 Our sample above is for a former Army Combat Engineer looking to get into a construction or demolition position. Our applicant decided to start with a summary of qualifications to give an overview of his particular learned abilities. This is a solid choice for anyone transitioning from the military to a civilian job. Another option which might give an officer with a more advanced skill set more freedom to highlight those skills would be to initiate the resume with a data-driven resume summary instead. Regardless of the style or format you decide to go with, don’t forget to follow all of the basic resume writing best practices, such as using plenty of action verbs and focusing on what you can do for the company and not what the company can do for you.